Provide the choices riders want while automating mobility management workflows. Facilitate greater access to transit and a wide range of transportation needs. Stengthen communities by providing the transporation services they need. Transit agencies and cities now have a steering wheel to the rides of the future. Goin's digital wallet provides rider self service and management insights to stream line fares and authorizes balances before the ride is even requested. Riders get a full record of their transactions and ride history. The days of dispatching and scheduling are over. Welcome to the future of mobility management. Watch rides as they happen and while monitoring network response times and service. Ever wonder how you're really doing? Asking the right questions at the right time makes all the difference. Get feedback on every ride, manage policy violations and incidents in one central feedback dashboard. Allow them to connect on their terms putting mobility management operations on autopilot. Provide rider choice with your organizations approved providers. Riders can use apps they already use or use Goin's rider app to choose a ride provider of their choice. No Data plan? Then texting is for you. Get notified by text message of ride arrival times and provide ride feedback ratings and comments all through text messaging. Goin selected for FTA Mobility on Demand grant to integrate ADA paratransit services with Lyft, United Taxi and CareRide. 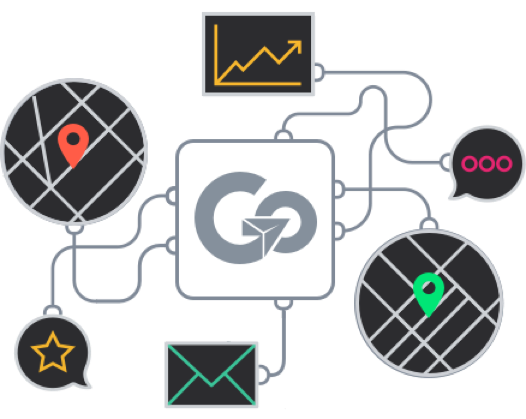 Integrations for Goin can be used across complete service areas - or selectively to individual service membership eligibility and specific locations. With providers and ride networks across the country, you can give your riders more choice, access and reliability.